I believe that counselling can be really powerful and help in overcoming a wide range of difficulties. It is however important to make sure that you feel comfortable working with your counsellor and that now feels the right time for you. I therefore offer a reduced price first session where you can come and meet me and see if it feels right for you. I offer a reduced price initial session at £35, with following sessions for £50. Sessions for counselling students are at the reduced rate of £35. I am a member of the British Association of Counselling and Psychotherapy. This means that I work ethically to their standards; ensuring I work to support you the best I can. An important part of this is you knowing that anything you tell me will remain fully confidential, unless I have severe concerns for your or someone else’s safety. I will discuss this in full with you when we first meet, however you are more than welcome to chat to me about any questions you may have. Where would I meet you? 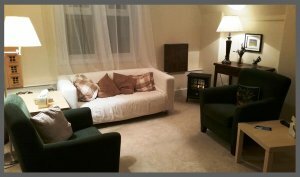 I offer counselling from a calm, comfortable counselling room in Market Harborough town centre. There are good transport links and parking nearby. Please see my contact page for a map. When you book an appointment I can give you more detailed directions. I understand that it can feel daunting booking your first session and can feel like a really big step. You are welcome to call me for a chat or send me an email and I’d be happy to talk through any questions you may have.